"I want to know what to deal is with this crazy bartender." 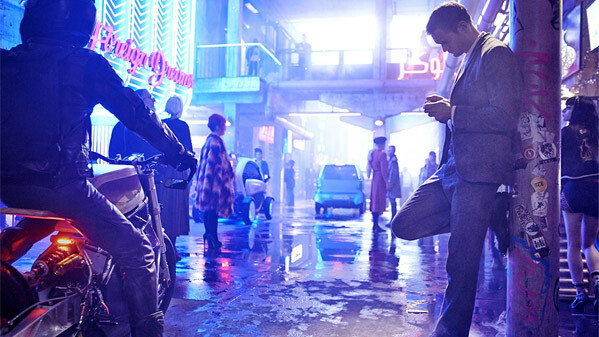 Netflix has finally unveiled the full-length official trailer for the new Duncan Jones sci-fi movie, titled Mute, set in a futuristic Berlin. This has been Jones' passionate project for years, he wrote the script way back before making Moon, and finally had the chance to make it with Netflix. Mute stars Alexander Skarsgård as Leo Beiler, a mute bartender with a violent past who is forced to take on the teeming underworld of a near-future Berlin as he searches for his missing girlfriend. The full cast includes Seyneb Saleh, Paul Rudd, Justin Theroux, Gilbert Owuor, Robert Sheehan, Nikki Lamborn, and Noel Clarke. We've been waiting forever to see this trailer, and it looks crazy funky and very cool. I'm super excited to see this, especially because it's set in Berlin (where I now live), but also because it's the latest Duncan Jones movie. Take a look below. "He doesn't need words." Set in the near-future, Leo (Alexander Skarsgård) is a mute bartender living in the pulsing city of Berlin. Because of a childhood accident, Leo lost the ability to speak and the only good thing in his life is his beautiful girlfriend Naadirah (Seyneb Saleh). When she vanishes without a trace, Leo’s search for her takes him deep into the city’s seedy underbelly. A pair of wise-cracking American surgeons (Paul Rudd and Justin Theroux) are the only recurring clue and Leo is forced to take on this teeming underworld in order to find his love. 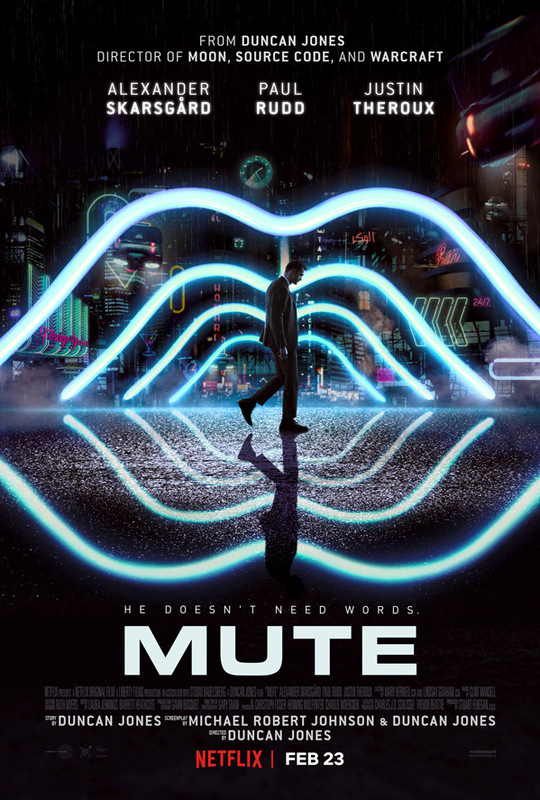 Mute is directed by English filmmaker Duncan Jones, of the films Moon, Source Code, and Warcraft previously. The screenplay is written by Duncan Jones, with Michael Robert Johnson and Damon Peoples. This has not premiered at any film festivals. Netflix will release Duncan Jones' Mute streaming exclusively starting February 23rd, 2018 coming up soon. First impression? Who's up for this?